Halozyme is pioneering therapies that remodel the tumor microenvironment to increase accessibility for chemotherapies, immuno-oncology agents, and innate immune cells. Halozyme is developing pegvorhyaluronidase alfa (PEGPH20) to treat pancreatic and other solid tumors. Clinical-stage biotechnology company Halozyme focuses on developing and commercializing cancer therapies that target the tumor microenvironment (TME). The cornerstone of Halozyme’s technology is pegvorhyaluronidase alfa, a proprietary pegylated recombinant human hyaluronidase that degrades hyaluronan (HA), a glycosaminoglycan of repeating disaccharide subunits of N-acetylglucosamine and glucuronic acid, and a major contributor to the struc­ture of the extracellular matrix and repair capacity of tissues. High HA levels in the TME of solid tumors can increase intratumoral pressure, resulting in decreased perfusion, reduced drug delivery, and increased chemoresistance. Pegvorhyaluronidase alfa is a first-in-class biologic designed to maximize therapeutic effect by degrading HA, resulting in increased activity and access for coadministered anticancer therapies and innate immune cells (Fig. 1). Pegvorhyaluronidase alfa is currently in develop­ment for the treatment of several difficult-to-treat solid tumors, including metastatic pancreatic duc­tal carcinoma, non-small-cell lung cancer (NSCLC), cholangiocarcinoma, gastric cancer, and metastatic breast cancers. The potential for this novel therapy is significant as it may be combined with a wide range of cancer therapies and used against difficult-to-treat solid tumors with high HA levels. Fig. 1 | Enlisting hyaluronidase to boost drug accessibility to tumors3. Pegvorhyaluronidase alfa, a pegylated version of Halozyme’s proprietary recombinant human hyal­uronidase (rHuPH20), catalytically degrades HA. This glycosaminoglycan, distributed widely throughout the connective, epithelial, and neural tissues and within the TME of some solid tumors, creates a matrix with water to form a gel-like substance that acts as a lubricant for tissues and joints. High con­centrations of HA in the TME can lead to increased intratumoral pressure, blood vessel compression, and decreased perfusion. All these effects can result in increased hypoxia, decreased immune cell access, and increased resistance to anticancer therapies. High levels of HA in tumors have also been associ­ated with decreased survival in several tumor types including pancreatic ductal adenocarcinoma, NSCLC, gastric cancer, and metastatic breast cancers. Pegvorhyaluronidase alfa degrades HA in the TME, normalizing interstitial fluid pressure, leading to res­toration of blood flow, facilitating the dispersion and absorption of coadministered anticancer therapies, and inhibiting the growth and metastasis of tumor cells. Pegylation affords pegvorhyaluronidase alfa an increased circulating half-life compared with that of unmodified rHuPH20, allowing for efficient delivery of the enzyme to the TME following intravenous injection. 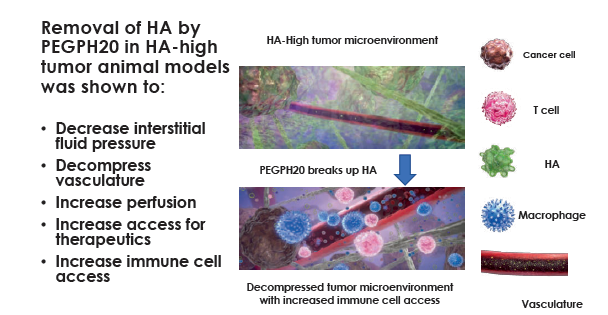 Therapeutically, reduced HA levels and blood vessel re-expansion result in a tumor that is more accessible to chemotherapies, monoclonal antibodies, innate immune cells, and cell-mediated therapies. Halozyme’s most advanced pegvorhyaluronidase-alfa-based program combines pegvorhyaluronidase alfa and nab-paclitaxel plus gemcitabine (PAG) for the treatment of pancreatic cancer. Results from the HALO 109-202 study, a randomized phase 2 clinical trial in patients with untreated metastatic pancreatic ductal carcinoma, demonstrated that the most pro­nounced benefit of pegvorhyaluronidase alfa was observed in patients with HA-high tumors (stage II), among whom a median progression-free survival (PFS) of 9.2 months was observed with PAG treat­ment, versus a PFS of 5.2 months for patients treated with nab-paclitaxel plus gemcitabine only (hazard ratio = 0.51; 95% CI, 0.26–1.00; P = 0.048)1. In 2016, Halozyme launched a phase 3 clinical study in ~570 patients with untreated stage IV pancreatic cancer at more than 200 sites in over 22 countries2. Halozyme also has four other clinical active pro­grams, three of which are in collaboration with external partners. All of these programs are in phase 1 clinical studies. Halozyme is investigating the use of pegvorhyaluronidase alfa in combination with Keytruda (pembrolizumab) to treat patients with metastatic NSCLC or gastric cancer. Eisai and Halozyme are testing a combination therapy of pegvorhyaluronidase alfa and Halaven (eribulin) to treat metastatic breast cancer. Roche and Halozyme are exploring the combination of pegvorhyaluronidase alfa with Tecentriq (atezolizumab), which is normally used for the treatment of pancreatic and gastric cancers, in patients with gallbladder cancer and cholangiocarcinoma. Halozyme and Ventana are also developing a com­panion in vitro diagnostic assay to detect high levels of tumor-associated HA in patients. The potential of pegvorhyaluronidase alfa to become the backbone for combination therapies with high- HA cancers makes Halozyme a partner of choice. Halozyme is the only company pursuing HA as a target for the development of cancer therapies. Halozyme is exploring partnering opportunities to expand the indications of and range of patients who can benefit from pegvorhyaluronidase alfa treatment. Hingorani, S. R. et al. J. Clin. Oncol. https://doi.org/10.1200/JCO.2017.74.9564 (2017). Halozyme. Halo Pancreatic 301. http://halo301.com (2017). Thompson, C. B. et al. Mol. Cancer Ther. 9, 3052–3056 (2010).